I love food! I think and talk about food all day even when I'm asleep... I'm "Live to Eat" kind of person not "Eat to Live". I want to enjoy every food I eat. I ONLY get to eat approximately 93688 times before I die (I'm Japanese woman so my life expectancy is 85.56 years old x 365 days a year x 3 meals a day) so I have to choose the best thing to eat every day. I would not like to waste a space in my stomach with some tastes unworthy food. I ordered Osechi from Delica this year. I really like Delica. It is one of the best Japanese delicatessen (Osouzaiya / Depachika) outside of Japan. 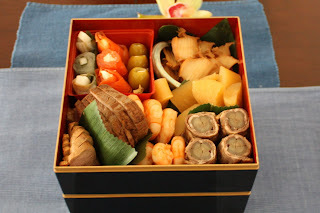 I think almost all Japanese people who live in Japan eat some sort of Osechi for the new year celebration. (FYI We celebrate January 1st / western new year's day). 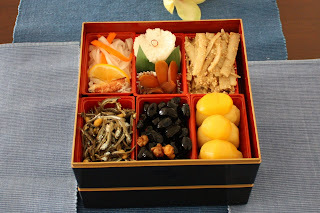 Osechi consists of many good luck dishes. New Year celebration is one of the biggest holiday of the year in Japan. Osechi dishes are prepared before new year's day and eaten 1st through 3rd of January (Called Sanganichi) so that women do not have to cook and can enjoy the celebration with family and guests. All the dishes are displayed in beautiful lacquered boxes and consumed cold. They are prepared to last at least 3 days by either braised, salted, pickled, candied or dried. We usually visit family and friends and eat Osechi at different houses for the 3 days. Each region and family have different variation for their Osechi. The restaurants, schools, stores, and almost all other stores are also closed for the first 3 days (it is changing now 10 years ago or so and some store stay open through the new year). 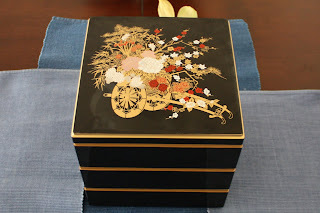 This years Osechi at Delica was $300 ($50 discount if you bring back the lacquer box from previous year). 1. Seasoned Prawns - Tasted like Preservative or chemical... May be farm raised imported shrimp? 2. Rolled Kobe style beef with Burdock - I liked the tasty crunchy burdock but Kobe style beef was too fat to be eaten cold. 3. 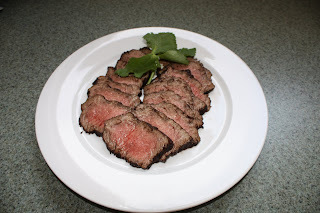 Roast Beef - It was tender and nicely cooked medium well. I think it could use little more seasoning and should have been sliced thinner. 4. Smoked Salmon with Fromage Blanc - Tasted ok but it's NOT Osechi! 6. Marinated Herring Roe - It was beautifuly prepared without any membrane but tasted bitter and I didn't eat them. When you prepare herring roe, you have to be careful not to over soak them. If you take away too much salt from the roe, it become bitter and uneatable. 7. Kombu Cured Sea Bream (Tai) - Tasted elegant. The tast of Kombu came through. 8. Roasted Duck Breast - Perfectly salted. Tender and not too fatty. 9. 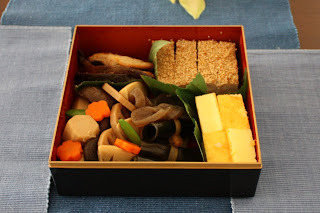 Salted Olives with Cheese - It is NOT Osechi and made everything in the box smell like olives. PLEASE DO NOT PUT OLIVES in Osech next year! 10. Pickled Daikon and Carrot with Dungeness Crab - I think they shouldn't have put Crab in Namasu (Picked Daikon /Carrot). Crab is not traditional and didn't go well with the dish. Also, crabs had cartridges in them... The vegetable tasted the way they suppose to be. Sweet sour and good. 11. Braised Burdock Root with sesame - Kansai style vinegary burdock. 12. Caramelized Dried Anchovy with Pine Nuts - I never liked this dish as I grow up but I was pleasantly surprised I liked them for the first time. It was nutty and not too sweet. 13. Sweet Black Beans - Perfectly cooked plump and shiny beautiful large beans. I could tell they used high quality "Tanba" beans from Japan. 14. Mashed Sweet Potato with Chestnuts - One of the best Kurikinton I ever had. Not too sweet. I could taste wonderful character of Japanese sweet potatoes. 16. Karasumi Bottarga (Salted dried Mullet roe) - Thinly sliced high quality Mullet roe. Very tasty reminds me of aged (24month+) Gouda. 17. Braised Shitake Mushroom Taro, Bamboo Shoot, Carrot, Lotus root, Konnyaku and Green Peas - I loved every bite. Perfectly cooked in light Japanese fish broth. Only thing was Lotus root was little overcooked..
18. Baked Omelet with Shrimp Puree - Nice light texture with hint of shrimp flavor. I ate it with soy sauce and wasabi. 20. Minced and Roasted Chicken with Saikyo Miso Topped with White Sesame. It was good but I think they put too much chicken fat in it. May be needed little more saltiness too. Overall, I was very pleased with Delica's osechi. I had low expectation since I never had a great store-bought Osechi before even in Japan. Except a few dishes I mentioned above, everything tasted great. I also liked the fact they did not use too much sugar in their cooking (In Tokyo where I grow up, Ochechi have "Amakara" sweet and salty seasoning which I do not like...) I think their seasoning style is Kansai (western Japan) style. I will buy their Osechi again if I'm in the US next year for the New Year. Addition to the Osechi I bought from Delica rf-1, I made Ozoni. Ozoni is a brothy dish with mochi (sticky rice cake) and a major part of Osech which almost all Japanese people who live in Japan eats in the morning of January 1st. 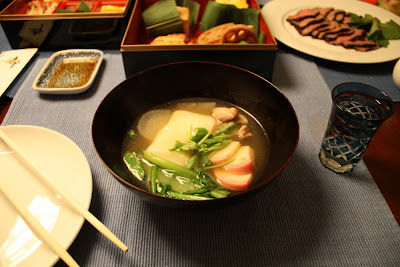 Each region make different kind of broth with (Shio / Salt, white Miso, Red Miso, or Soy sauce). The contents are different by region too. With seafood or with chicken? Round moch or rectangular moch? My mom's recipe is Tokyo style. It is also my family tradition to make Japanese style roast beef (we eat it with Japanese yellow mustard) for the New Year celebration every year.